We’d love your help. Let us know what’s wrong with this preview of How Do Dinosaurs Stay Safe? by Jane Yolen. 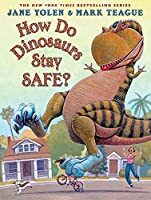 From crossing the street with Mama to encountering a stranger, the playful but careful antics of America's favorite dinosaurs will make readers laugh aloud -- and prompt discussion of safety issues. Few things in childhood are as important as learning how to behave safely, and the topic deserves discussion in every family. 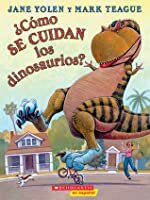 Now Jane Yolen and Mark Teague deftly approach this From crossing the street with Mama to encountering a stranger, the playful but careful antics of America's favorite dinosaurs will make readers laugh aloud -- and prompt discussion of safety issues. Few things in childhood are as important as learning how to behave safely, and the topic deserves discussion in every family. Now Jane Yolen and Mark Teague deftly approach this critical subject with warmth, humor, and hilarity. The wildly funny contrast between Teague's massive dinosaur children and their human-sized surroundings makes this subject especially appealing and funny. 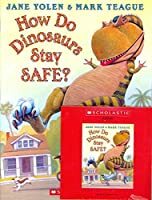 Where a book about safety for children might be potentially frightening, the antics of immense dinosaurs jumping on the bed or learning how to dial 9-1-1 on Mama's tiny phone will keep readers laughing from start to finish. 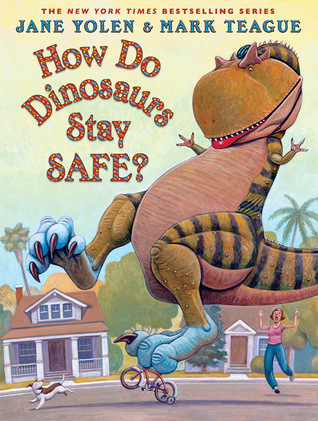 To ask other readers questions about How Do Dinosaurs Stay Safe?, please sign up. For what ages is this book suitable? Gina I'd say probably two and up. The joy of these books is in the pictures of dinosaurs doing things they aren't supposed to, and the dinosaur on the skateboard on the publication info page of this book is one of my new all-time favorites in the series. Adorable illustrations and good concept but not as cute as I hoped. The purpose was more to teach kids safety procedures which is at least a 4 star worthy cause. Such a cute story! My girls loved this book! We will definitely be checking out others. My girls ages 3 and 6 thought it was very funny. Yeah! I like it 30 out of 10! I don't like it. I just like the pictures of the dinosaurs. I like real dinosaurs. A good preschool storytime choice, with dinosaur appeal and content grownups love. These books are admittedly pedantic, but families love them and the messaging in this one isn't too obnoxious or patronizing (looking at you, How Do Dinosaurs Learn to Read?). Love doing this in preschool storytime, where the kids will laugh and say "No!" as the answer to each question. Definitely roar like dinosaurs throughout and at the end, too! A delightful book that can serve as a good springboard for talking about many different kinds of safety. **Talking Points - What safety rules do you know? What safety rules do you sometimes want to break? Who do you respect more, someone who follows the rules or someone who doesn't think the rules apply to them? As much as I love the illustrations in this series of dinosaur books, I just don't think my child quite understands the order that the book is written. It tells you all the bad things first and I have to tell my child "No" after each page... until it actually gets to the proper safety parts. Great series of books to teach kids right from wrong. Both kids are starting to come around to this series. My daughter is picking up on the messages but I think they both just get satisfaction out of seeing dinosaurs do human things. The book begins with examples of ways a dinosaur could be unsafe. Using rhyming words and detailed illustrations, the dinosaurs then show examples of much better ways to be safe. We love the rhyming dinosaur books. This book is also nice to bring up subjects that you can discuss with your child -- strangers, walking across the street, etc. I especially like how the names of each dinosaur are written out underneath them. Cute for ages 3-5. I like how the names of the dinosaurs are included and the pictures of dinosaurs behaving like toddlers made my toddler friend giggle. A cute book in a cute series. The illustrations are so much fun! A story that teaches children how to stay safe in a way that entertains them. How Do Dinosaurs Stay Safe? is a picture book about dinosaurs, and how they behave properly. When I first saw this book, I was captured by the beautiful, colorful drawings. There are often two page spreads; the only picture that is a single page spread is the last picture of the book! The message of the book is pretty simple: it shows children how to act safely, with the dinosaurs acting as children. I felt this book would be especially good for little boys. I remember many of my childhood playma How Do Dinosaurs Stay Safe? is a picture book about dinosaurs, and how they behave properly. The message of the book is pretty simple: it shows children how to act safely, with the dinosaurs acting as children. I felt this book would be especially good for little boys. I remember many of my childhood playmates being into dinosaurs. The book is part of a series; apparently the writers publish many books with dinosaurs as the main subjects. Jane Yolen has hit the jackpot with her 'How Do Dinosaurs' formula. These titles have sold over 14,000,000 to date. My local library really enjoys the series and tells me they are very popular right now. 'How Do Dinosaurs Stay Safe?' is very nicely illustrated. This title is supposed to help teach proper manners to children. It teaches table manners, to wear a bike helmet, not to go with strangers and such. This one seems geared specifically to boys. The rough-and-tumble type activities the dino Jane Yolen has hit the jackpot with her 'How Do Dinosaurs' formula. These titles have sold over 14,000,000 to date. My local library really enjoys the series and tells me they are very popular right now. 'How Do Dinosaurs Stay Safe?' is very nicely illustrated. This title is supposed to help teach proper manners to children. It teaches table manners, to wear a bike helmet, not to go with strangers and such. This one seems geared specifically to boys. The rough-and-tumble type activities the dinosaurs partake and the use of 'he', 'his', 'him' throughout may not be an attraction to young girl readers. Although, dinosaurs are a neutral draw for young children. Dinosaurs appeal to boys and girls but it seems to be more of a book intended to catch the boy readers. I have really liked all of the How Do Dinosaurs..? books that we've read. I initially picked 3 of them up at Kohl's as "Kohl's Cares for Kids" books (the $5 books that the proceeds go to charity). Brooklyn loved them! The dinosaurs are really cute and the pages are large and pretty vibrant (without being overly so). I discovered at the library a few weeks ago that there are a lot more now! So we've slowly been picking them all up. Brooklyn still enjoyed this and kept pointing at the dinosaurs and I have really liked all of the How Do Dinosaurs..? books that we've read. I initially picked 3 of them up at Kohl's as "Kohl's Cares for Kids" books (the $5 books that the proceeds go to charity). Brooklyn loved them! The dinosaurs are really cute and the pages are large and pretty vibrant (without being overly so). I discovered at the library a few weeks ago that there are a lot more now! So we've slowly been picking them all up. Brooklyn still enjoyed this and kept pointing at the dinosaurs and the silly things they do.